CAS(E) #6 - above (my card) below the sketch. 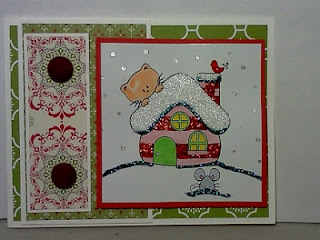 The stamps I used are Serene Silhouettes and Hostess set Wacky Wishes. 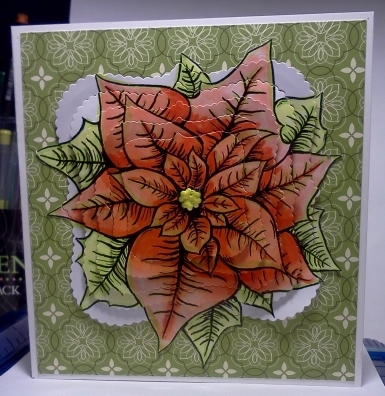 I stamped in Versa Mark and heat embossed Very Vanilla ep. I call my card sticker fun! All of the background is stickers. As are the sleigh and sentiment. 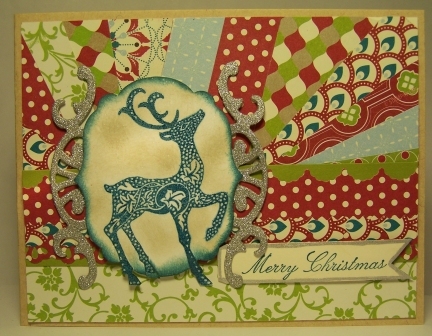 I stamped the reindeer from LOC - Reindeer Waltz in Cherry Cobbler ink and then stamped it again without reinking. I craft cut and added rhinestones. I love the way it turned out! Very CAS!!! Tuesday Morning Sketch #174 - Unity Stamp of the Week. Isn't he just a little cutie? Stamped in Basic Black and Gumball Green. I've added Stickles and stickers to complete the project. 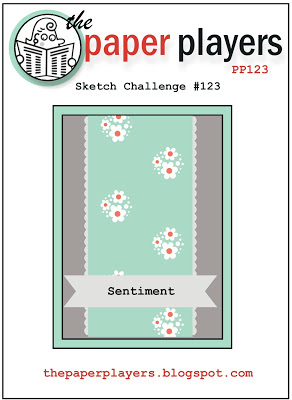 The Paper Players #123 - really neat sketch. 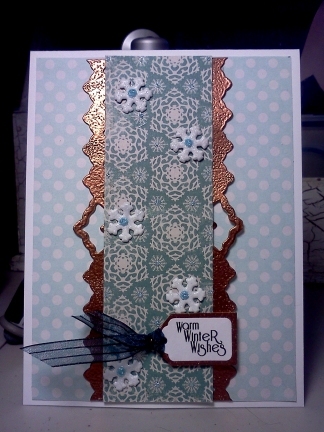 I've used some papers from my stash and I even added a faux copper border to my card. 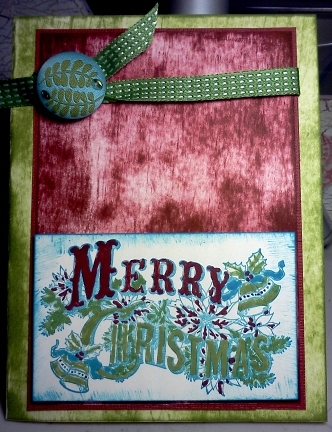 I just die cut the border from whisper white cs and then I used Versa Mark ink and completely covered the cs. Then I sprinkled Copper embossing powder all over it. Heated and voila! A beautiful shiny copper border. The snowflakes are brads. It's beginning to look a lot like Christmas. 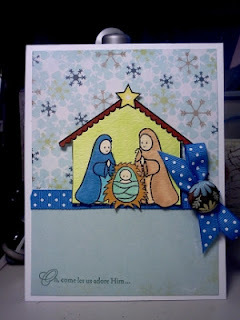 I love this little nativity by SoftPencil Studios. It's so cute and so sweet. 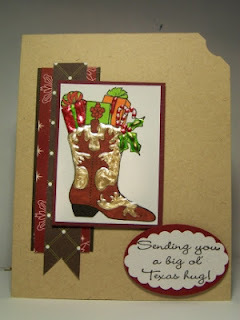 Just color with your markers and you are good to go with a focal point for your Christmas cards this year. It all goes together pretty quickly. I hope you have a wonderful Christmas season and that you are truly blessed throughout the coming year. It's SoftPencil Tuesday. Visit SoftPencil Studios! Our biggest online sale of the year starts today! From November 19th-28th, you can receive discounts of 20%-50% off select products! No standing in lines or fighting crowds required! To kick off this event, we have three of your favorite products at 20 percent off for TODAY ONLY. But that's not all! check out all the other incredible deals either on my website or download the flyer. Recently I purchased a few digital images from Elizabeta Kushner's etsy shop. The moment I saw this poinsettia I knew I was going to try the telescoping tecnhique. So using Copics and coloring the image I then used a complete set of Spellbinders' dies to cut the image into peices. Once the image was colored and cut I started with the largest cut and worked my way out. Maybe I should have started in the middle, because it gets pretty tight for placement working outside in. But I got er' done! When the telescoping was completed I went back and craft cut the bits of petals and leaves that were cut off by the largest die. I then attched them directly to my dsp. I added some yellow Ranger Pearls in the center. This one was done! ONLINE SHOPPING only, so click on my "shop me" button in my side bar, and get your account set up and activated ahead of time…this one may crash the server, LOL..
Stay tuned for more details coming very soon. Purchase the Starter Kit - For just $99 you will receive $125 in products of your choice plus a FREE collection of ink pads ($49.95 value). And, you'll get to test drive the awesome demonstrator benefits and resources through at least April 2013 with no obligation to purchase more. Host a qualifying Stampin' Party or Private Class - When you host a party that reaches a minimum of $450 in total sales, you'll receive a free collection of ink pads! ($49.95 value). Contact Me to schedule your party or private class. I have 2 male birthdays coming up early in December and they are father and son. 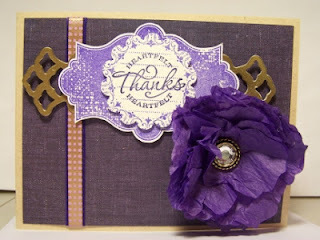 So I decided to use my Stampin' Up! sets : A Cardinal Christmas and Le Jardin Botanique for my image and Beautiful Birthday for my sentiment. 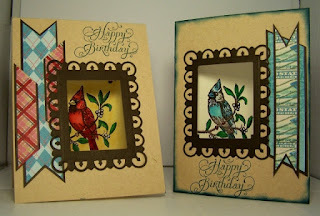 I am sooo excited I got my Spellbinders dies to work perfectly together on the windows and my Copic Markers really brought the beauty out in these two beautiful birds! As you can see the cards are similar but quite different. I used the Freshly Made Sketch #60 to layout my cards. I am not sure they will let me have 2 entries in the drawing this week but once these were made I just had to share them. Visit Freshly Made and check out the challenge for yourselves. 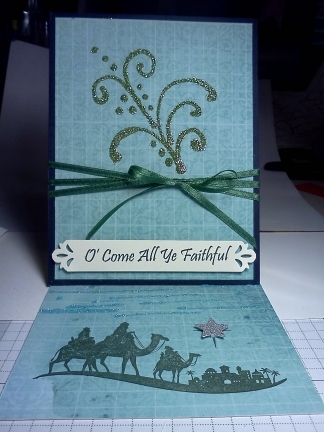 O' Come All Ye Faithful - Love that Christmas carol! It was a toss up for me though as my favorite all time Christmas carol is a version of Oh Happy Day. I guess too in this case We Three Kings would have worked. This card has been entered into the Crazy4Challenges Blog Challenge this week. 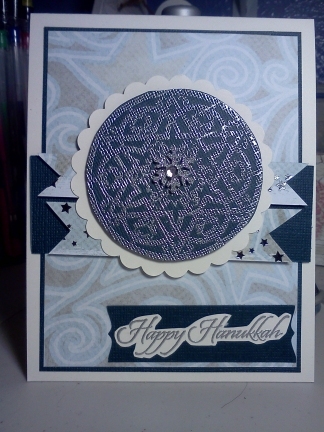 This dsp has a faint shimmer to it and it's got a distressed look as well with a faint varied pattern in a grid. I've stamped my image in Staz-On Hunter Green. Then with my Tombow glue I have drawn out lines for my sky and the flourish up top. 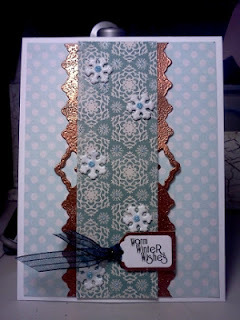 I sprinked glitter in these areas - flourish is green and sky is blue. My sentiment is computer generated using the font - Pristina. My little glittered star of Bethlehem is punched using the NEW SU punch Pack - Merry Minis #126882. Now I challenge you to pop on over to the C4C blog and create something using YOUR favorite Christmas carol. 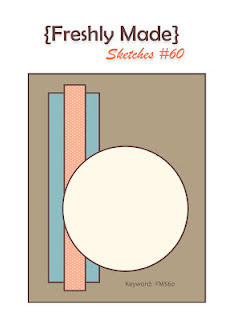 I Spy Sketch #41 - Love it! Above is my card and below is the sketch. I'll be back later with deets. Right now someone is dropping in and I need to visit with my friend. Color Throw Down #217 - Basic Black, Whisper White, Lucky Limeade, and Not Quite Navy. Ok can I just start by saying, I LOVE THIS COLOR COMBO!!! Of course my inks are all Stampin' Up! and exactly the ones requested in the challenge. I brayered Not Quite Navy for my sky and Lucky Limeade for my ground. I stamped the image and sentiment in Basic Black. The stamps are from the Come to Bethlehem set #120591. I punched two pieces of black with the Modern Label Punch #119849. The chipboard is not Stampin' Up! but the stars are Whisper White punched with a discontinued punch. 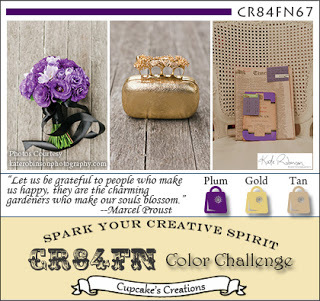 Don't forget to check out the DT samples on the Color Throw Down blog. The Paper Players Challenge #120 - Give Thanks. 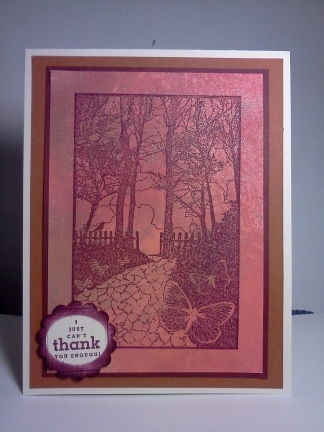 The background color for my scene was created using Stampin' Up! Champagne Shimmer Mist mixed with Calyso Coral, Cherry Cobbler, and Handsome Hunter ink and alcohol and spritzed on.Then the image was stamped in Rich Razzleberry. Love these challenges. Here's the image for the challenge this week. There's still time to play but you better hurry! Freshly Made #60. Very CAS!! Love this sketch and I whipped this one out in about 20 minutes. Of course the boot was already colored and set to go with the pearl stickles. Check out the sketch for yourself at Freshly Made and don't forget to leave the DT some love. Below is the sketch. Now I am off to lunch with my gal pals as one of them is celebrating a birthday today! Happy Birthday, Nancy! 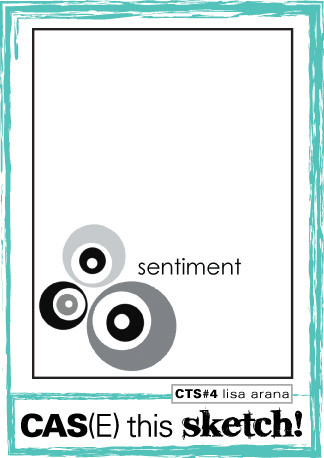 Here's my card for SoftPencil Tuesday #31. 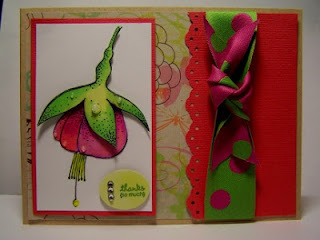 Today I used the Fuschia. I love coloring this flower. There's not a lot to it but no matter what your color choices it always looks terrific! Be sure and check out the rest of the DT projects this week and if you'd like to get in on the fun with these stickers or any of the SoftPencil Studios Products just click HERE. 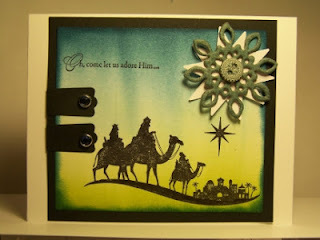 Flights of Christmas was created to enter into the Paper Take Weekly challenge of anything goes with a bonus challenge to do Christmas. 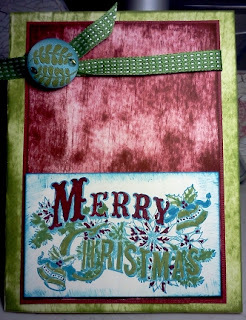 For my card I started with some Cajun Craze cs, Letters to Santa dsp, Whisper White cs, Clear Window Sheets, Floral Framelets and Seasonal Sayings Christmas (from the SU Clearance Rack). 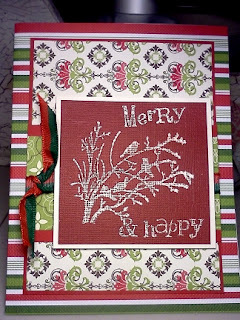 First of all, I stacked my card blank ( 4 1/4" x 11"), same color Cajun Craze cs (4" x 5 1/4") and my dsp (4" x 5 1/4") and ran them through my Big Shot with the Floral Framelets die. Making sure I cut through all 3 pieces at once. Then I adhered the dsp to the front of the (4 1/4" x 11") card blank. 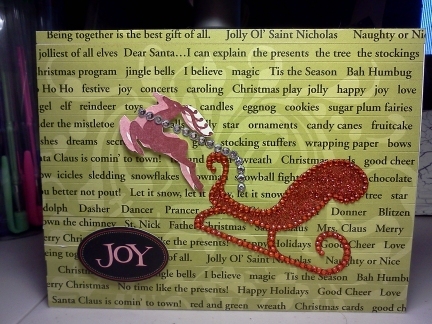 Then on the inside of the card blank I placed a piece of the Clear Whindow sheet ( 4 1/8" x 4 3/") and adhered it with snail. Then I placed the remaining piece of Cajun Craze cs over it and adhered. 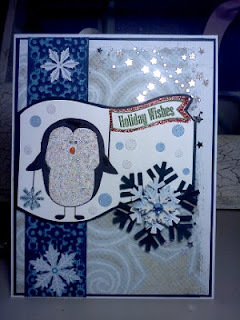 Next I cut a piece of Whisper White cs at 4' x 5 1/4' and adhered it to the inside of my card. Then using one of the cut outs I daubed Calypso Coral ink all around the outside edge of the cut out making a halo. Then I stamped in Handsome Hunter the sentiment. 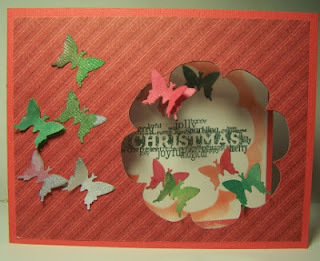 Next I punched a bunch of little butterflies from Whisper White cs. Using my Champagne Shimmer mist and Cherry Cobbler, Calypso Coral, Wisteria Wonder and Handsome Hunter reinkers in separate spritzer bottles I spritzed my little butterflies. I loved the varying colors. To get some multicolored butterflies I dipped them into other puddles of spritzed colors. Some butterflies are glued inside my card around the sentiment. Some butterflies and stacked and glued onto the outside of the card on the dsp and finally 3 butterflies have hit onto the Clear Window Sheet. I've lovin' it! How bout you??? Hope you'll come back again. Please leave your comments. I have a lot of views but not much feedback. 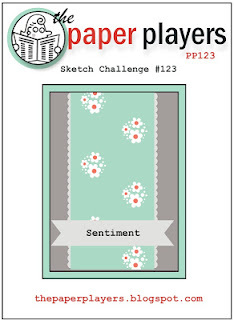 Don't forget to checkout the challenge at Paper Take Weekly. Here's my entry for the CAS(E) this Sketch Challenge #4. Love the sketch! brougth to us this week by Lisa. 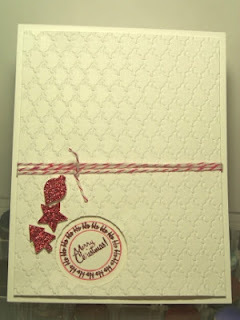 I've played with Whisper White cs from Stampin' Up! 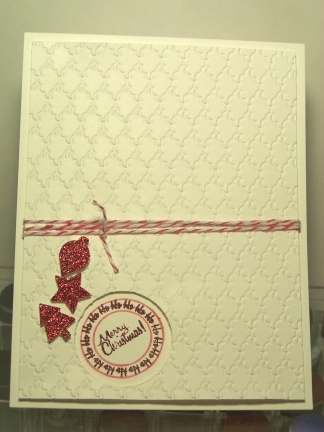 along with the punches, twine, embossing folder and glimmer paper. Stamps are from Craft Lounge.